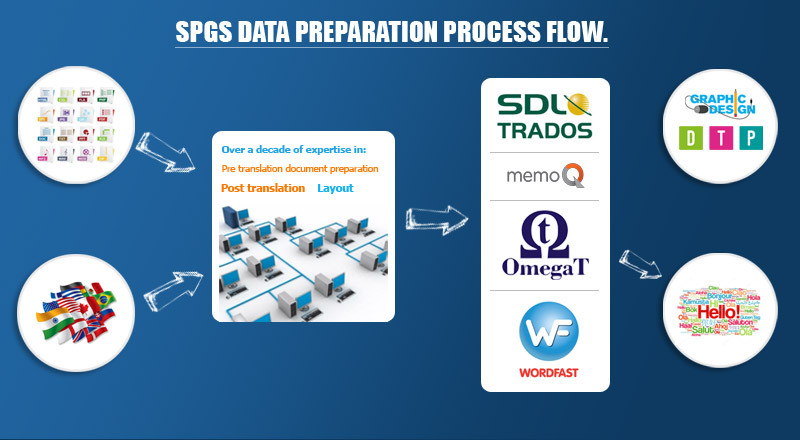 SPGS has over 13 years of expertise in the preparation of documents for translation process. Several translation companies, around the world, trust SPgS, in terms of Quality, adherence to the TAT and flexible Cost Structure. Trusted data security assured for your documents. In the translation Industry, when you receive a PDF or Image document for translation, perfect preparation of documents for translation is very important. The prepared document should work in CAT tools like SDL Trados Studio/MemQ, without any issues. Every PDF or Image document, that you receive for translation, has an underlying document format , which can be recreated in Microsoft Word, Apple iWork, Adobe InDesign, Adobe Framemaker, or several other applications. Therefore, if possible, ask your customer to send you the original document that the PDF was created from. If the Original document is not available, we are here to help you in the preparation of documents for translation. You can trust us for high quality, timely delivery and competitive rates, in the preparation of documents for translation. Stream Perfect Global Services is strictly adhering to the below steps, while we do the preparation of documents for translation. Extracting data, from the PDF /Image file , using suitable software. Comparing the extracted documents with those from the scanned files. Manually correcting and replacing every misread character and word. Saving the corrected document in the client required format. In addition to the text, corrections are made in footnotes, tables, graphs, and other technical data. Our extensive expertise and innovative methods in optical character recognition cleanup allow us to provide accurate output. The Preparation of documents for translation is a tough one to handle and you may require experienced companies, to meet the deadlines, with your client.